Chocolate Strawberries with colorful sprinkles make a delicious sweet treat. Use sprinkles to match your party theme. There are all different colors and types of sprinkles you can select from. You can use sugar crystals, shape sprinkles or holiday sprinkles or even crushed candies or nuts. Arrange your chocolate dipped strawberries on a platter or in small paper candy cups. Brush chocolate evenly with silicone pastry brush or spoon chocolate on top of strawberry and turn to let excess drip. 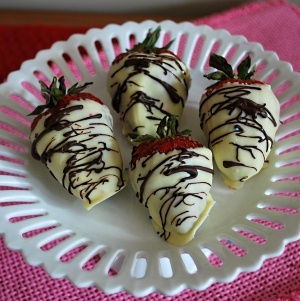 Place strawberry on waxed or parchment paper and sprinkle immediately as you cover it with chocolate. 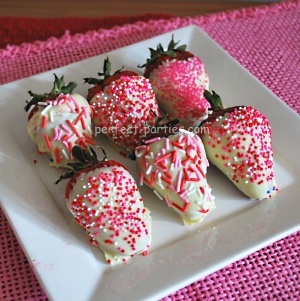 You have to sprinkle the strawberries as they are dipped. Let set and harden. For quicker results and a harder coat, place in refrigerator for 30 min. We just microwaved a cube of chocolate since it requires only a small amount. Using a fork, tap or gently shake so chocolate drizzles on the strawberry. We added the chocolate after the white chocolate hardened. Extra chocolate? Dip other fruit such as blackberries, or even dried fruit like apricots. 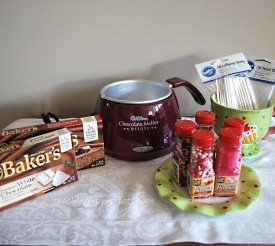 You can also make some easy chocolate bark. Pour onto parchment paper for easy removal and add nuts, dried fruit like cranberries, mini m and m's.